People want to know what "RA~SHEEBA" Energy is, where does it come from and what does it do. I will attempt to answer these questions with the knowledge of what we know at this early stage. RA~SHEEBA is a very powerful section of the available Universal Healing Energy. As a collective vibration of humans, we have reached the required level of vibration, and the vortex of information and energy has begun to filter through. The last time that this level was accessed was in Egypt when "The Watchers" vibration finally reached this level. 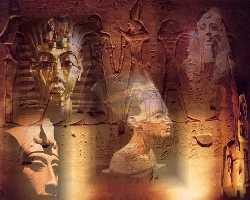 The main players were ready and the one who had the power to pass this on to the people was the Pharaoh. After the Pharaoh died, all was lost. Now these main players are back on the 'game board', ready to hold this energy once again. This time it will be held by the many and will be valuable in assisting in the ascension status. This time it is not to be abused! It cannot, because there is not one person or group responsible in holding it. When the many hold it and are able to show integrity, then the greater flow of energy will begin as never before. This is the first time that the "RA" energy has combined with the "SHEEBA" energy. The "SHEEBA" - Sexual, creative, joyful, expression of LOVE, the feminie 'part' of this column of Universal Healing Energy which leads straight to the Source. The "RA" - The Source, from the centre of the Great Central Sun. The RA~SHEEBA healing works directly on the Chakra's. Changing our DNA and electro-magnetics. In doing so, it teaches us and connects us to LOVE. Love being the thing that helps us progress on all levels. We need to hold the Energy and allow the vibration to change us. Hold the Light. Show our Light to all and see who recognises the Light. WHAT DOES THE ATTUNEMENT DO? It changes your vibration, changes your soul colours and opens the way for love to flow within your being. HOW DO WE KNOW WHEN WE ARE READY TO HAVE A RA~SHEEBA ATTUNEMENT? You will resonate with the vibration. At the moment it is those who 'contracted' to be once again 'The Watchers' and holders of the RA energy. You will recieve the manual and certificate by e-mail.